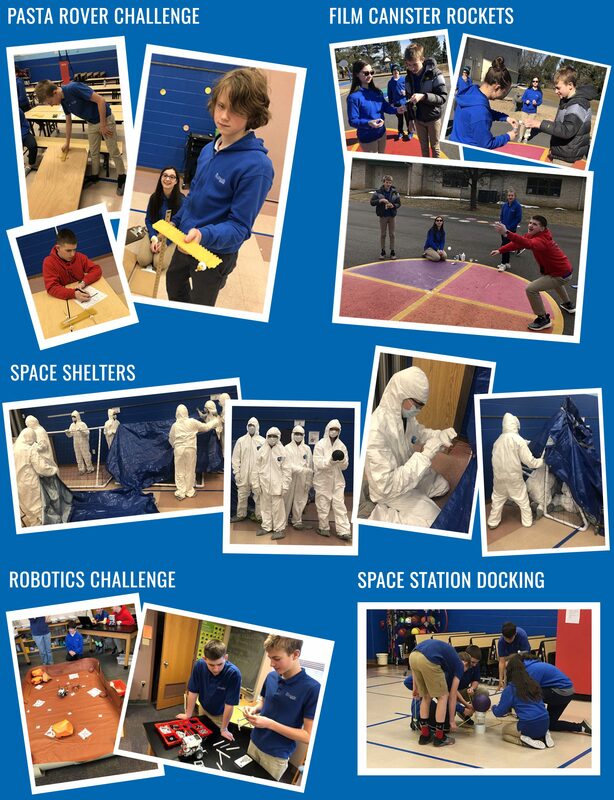 Ms. Heffner’s 7th graders spent the last month studying the red planet which included everything from reading The Martian by Andy Weir, to building rovers (made of both Legos and pasta), testing rocket launches, docking space stations and even creating their own Martian shelters! Check out some highlights from this awesome interactive and collaborative cross-curriculum unit! Students were tasked with designing a rover out of pasta and testing to see how far their rover would travel down an inclined plane. Each group made two prototypes and tested each rover three times. Distances and speeds were averaged for each. Students learned about Newton’s 3rd Law and chemical reactions by testing how quickly various liquids like water, milk, lemon juice, soapy water and rubbing alcohol would react with an antacid tablet. They noted how long each reaction took to occur and then graphed their results. Students participated in a simulation that allowed them to experience the challenging situation that Mark Watney, protagonist in The Martian, faced. Working as a team, and wearing full space suits, students had to construct a shelter that could withstand Martian obstacles – it had to be airtight, able to withstand a dust storm and accommodate all students. Students constructed robots out of Legos and then programmed them to move around different types of terrain. Students learned about the purpose and functions of the International Space Station and worked collaboratively to “dock” a space craft. Communication was key in being able to successfully dock their space crafts, as the task required precision and teamwork.